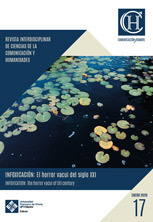 1.1 The objective of the journal Comunicación y Hombre is to provide a window for refection and a platform for the diffusion of scientific studies that help us to better understand the field of Communication Sciences, taking the fundamentals of humanism as a reference. As a consequence of this specialised, scientific nature, the journal cannot accept articles of general interest nor ones that exclusively give opinions instead of conclusions after due research. 1.2 The journal Comunicación y Hombre accepts original and unpublished articles related to the nature of the publication, which will be studied by the Editorial Board for possible publication. It is essential that all authors have the title of doctor for their work to be published, except for exceptional cases that will be studied by the Journalistic Board. 1.3 Acceptance depends on the approval of the Editorial Board, with both the author’s and evaluators’ identity remaining anonymous at all times. This double-blind peer review process will determine the acceptance, acceptance with reservations or non acceptance of the article. In the case of acceptance with reservations, the article will be returned to the author for adaptation in accordance with the suggestions made by the evaluator. Once this has been completed, the article is then returned to the journal for further review. 1.4 The Journalistic Board reserves the right to publish articles that have been favourably evaluated in the journal issue that they see fit. 1.5 the same author may not publish two articles in the same issue nor consecutive issues, with the exception of the reviews section. 1.6 This delivery implies the transfer of all copyright for future publication. 1.7 The publication of articles or reviews in the journal Comunicación y Hombre are not entitled to any remuneration. Copyright belongs to the Universidad Francisco de Vitoria and it is necessary to gain permission from this institution for any reproduction. To this end, the authors must sign a transfer of rights agreement and a declaration of conflict of interests. This is a necessary requirement for the publication of the article. In any case it will be necessary to indicate the origin of any total or partial reproduction. 1.8 Institutional affiliation and the email address of the authors will be published alongside articles and contributions for subsequent possible communication with readers. 2.2 Research: Space open to different research related to the journal’s general field of interest. Research articles of a theme freely chosen by the author may also be proposed, as long as they may be adjusted to the informative objectives of this publication. Articles proposed to the Study and Research sections of the journal must propose research contrasted with the necessary internal unit and the relevant contributions that are characteristic of a scientific publication’s content. Regarding word count, the bibliography, footnotes and abstract are not included. 2.3 Reviews. Of recently published works related to the journal’s field of interest. As a general rule, reviews are accepted of works published within the last few years, although in the case where a certain work is deemed of great importance, this time period may be extended. Reviews must be between 1,000 and 2,000 words. They must be preceded by the work’s full reference, in the following order: Author, title, publisher, place of issue, year of publication and number of pages. 3.1 The authors will send their originals through the OJS system, to Comunicación y Hombre. To do so, they must first register on the platform (see “Help”). Together with the article, the author must complete the fields required by the system (following registration). All that takes place following the edition process will do so by means of the platform and will be communicated through the same. 3.2 Articles are also to be sent to the following electronic mail address: redaccion@comunicacionyhombre.com Following the formal rules of presentation that are detailed in section 4 of this document. 3.3 The journal will send an acknowledgement of receipt of the articles received and once evaluated will inform the person concerned of its acceptance or, in the case of a negative evaluation, will return it. Both the date of receipt and the date of acceptance for publication will be reflected. For the bibliographic references at the end of the article, the following rules in the sixth edition of APA format (American Psychological Association), contained in the Style Manual: Publication Manual of the American Psychological Association, available at www.apastyle.org. All articles and research that does not comply with the APA style format will be returned to the author for possible adaptation. – Book up to 6 authors: All the authors (up to three, four, five & six according to the number of authors) Surname, First Initial, Surname, First Initial, Surname, First Initial, Surname, First Initial, Surname, First Initial, & Surname, First Initial. (Year published). Title of the book in italics. Place of publication Editor. – More than six authors: Include the names of the 6 first, then add ellipses and add the name of the last author. – Printed periodicals: Surname, AA, Surname, B. B, and Surname, CC (Date). Article title. Name of the journal, volume (number), pp-pp. – CD sources: Surname, A. (Year of publication). Title of work (Edition) [CD-ROM]. Place of publication Publishing house. – Movies: Surname of the producer, A. (producer) and surname of the director, A. (director). (Year) Name of the movie [film tape]. Country: producer. – Television series: Surname of the producer, A. (producer). (Year) Name of the series [television series]. Location: Producer. • Vídeo: Surname of the producer, A. (producer). (Year) Name of the series [Source]. Place. In the case on in-text citations, they are written in the text itself in the following manner: (Author, year of publication and page). If the citation is less than 40 words, it is placed as part of the body of the text, between quotation marks, followed by parentheses within which is indicated the reference data. When the citation length is longer than four lines (forty words), it is cited a paragraph apart without italics nor quotation marks, with a 2.54cm margin or 5 tab spaces. Example 1: Ekolman (1981) and Perry (1990) insisted on the importance of introducing abstract ideas to linear algebra gradually. – Over-use of tables and figures should be avoided, and should be sent within the article and as a separate file. – Tables should be numbered with Arabic numerals in order of appearance. Example: Table 1. – The Figures (photographs, images and graphics) should be numbered with Arabic numbers Example: Figure 3. – The images may not have been resampled by an image editor. Resampling does not increase the image quality. – Images that do not meet with the quality standards mentioned are not included in the work. – The Editor may change the size and positioning of the image for technical reasons, with the author’s permission. – For the identification of all (tables and figures) there will exist a short title at the top and the source cited at the bottom. – Bold will be avoided whenever possible. – Similarly, underlining texts will be avoided. – All paragraphs must be ended with a full stop. – There may be no blank space between paragraphs. – Chevron or Latin quotes are to be used («») when the norms should require them. In the case of quotation marks that appear in quotation marks, the interiors are straight or English (“”): «…..”……..”……». The full stop, the coma and the semicolon are to be placed after the closing quotation mark. If there are three points, they are to be placed before the closing quotation mark and after the appropriate sign. – Unnecessary foreign words should be deleted. – Acronyms the have the Spanish equivalent should be used: EE.UU. and not USA. The plural of acronyms is not marked graphically with the s, although it is correct to pronounce in oral language, so that it is more correct to write the NGOs, not the NGOs nor the NGO’s. – The months and days of the week. – Positions: the minister, the chairman, ambassador, the director general, the bishop, the judge, the judge, the king, the pope, the prince, the doctor, the rector, the vice president, the dean, etc. – Honoris Causa is written in lowercase and in italics, as with all Latin and foreign words. – After a colon, lowercase must be used, except if a quoted citation is introduced, in which case it must begin with upper case. – Department names begin with uppercase. – Uppercase is used for the first letters of End-Of-Degree Project and End-Of-Master’s Degree Project. Their abbreviations will be EDP and EMP. Thesis Doctoral in upper case. Also beginning with uppercase: Self-Awarded Title, Postgraduate, Doctorate and Master’s, when found in a title: Master’s in… or when named as a category: Postgraduate students; when used for general reference, in lowercase: he took great advantage of his master’s studies. Community Education and University community are with initial capitals. Italics are used exclusively for titles of books, journals, magazines, newspapers, conferences, foreign or Latin terms or to highlight words or phrases. For compound words the dash should be used as a general rule, unless its use is well known and accepted, for which the dash should be deleted.